However, I ended up dropping the Shanghai Bok Choy stir fry, and went with the Salmon Burgers, Baked Potato (regular and sweet) Wedges, and White Chocolate Mousse with Pumpkin Gelato and Chocolate Triangles for garnish. I'm happy with how the mousse turned out, although I'm not a big mousse fan. 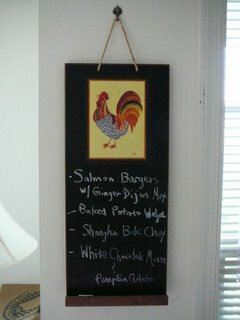 The salmon burgers were great, but I didn't add quite enough salt. Enough chit-chat, onto the recipe. Remove the skin from the salmon fillet, and remove and bones that you might see. I find that peeling the skin off works the best. Chop the salmon meat into small pieces. Add in all of the other ingredients, with the eggs and Panko added last. Don't add too much Panko, because you want the mixture to hold together well without being too dry. If 1 egg is not enough, add in another one. Form the salmon mixture into patties. Saute in olive oil, ~ 4-5 minutes per side, depending on thickness. Add a dash of butter to a separate skillet, and lightly brown fresh brioche rolls, cut into buns. Also, lightly sautee and carmelize some purple onions. 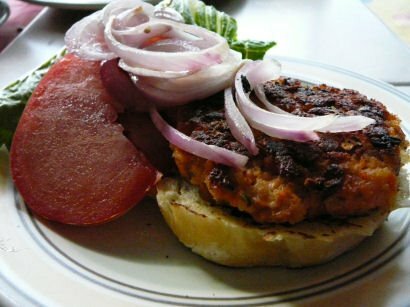 Serve salmon burgers fresh with lettuce, tomatoes, and onions.